Alex: My brother’s move from Sydney to Melbourne was a blessing in disguise and you’ll understand why after you read this post!! Before I start! I thought I grew accustomed to the freezing cold after spending winter in New York, obviously I was wrong. Walking around in 9 degree weather during the day when your’re not dressed appropriately really isn’t ideal but any-ways…To ease my whining cold state my mum took me to one of her favourite places in Melbourne. Chokolait in the Hub Arcade. This has become a household name to us in Casa Squadrito as Mum never shuts up about the dark chocolate Mocha. “It’s the best mocha I’ve ever had!” said both my mum and Bianca and for Bianc to say that says a lot. The cafe was virtually deserted with maybe two or three other people sitting at nearby tables which I was quite surprised by until I then found out that there was a new Chokolait store that opened in the massive Emporium shopping centre. As the waiter placed the mocha in front of me I saw the dark chocolate oozing from the top of the cup and I knew I was in for a treat. I slowly but eagerly raised my glass and took a sip and then… pretty sure I died and went to Chocolate heaven. My mum looked at me with an ‘I told you so face’ and I just laughed. It truly was the greatest mocha I’ve ever had in my life…ever! There’s nothing more to say! Hours of shopping led us to the Emporium (no, as much I wanted to, I didn’t get another Mocha) but it just so happened that Jimmy Grants was there and it was lunchtime. George Calombaris’ fast food restaurant is vibrant, fresh and realistically a great place for a quick bite. My older brother John and I both got the ‘Mr Papadopoulos’ ($9.50) a lamb souvas (souvlaki) with mustard aioli, onions and parsley completely packed with chips. There were both good and bad things about The Souvas. Pros; the lamb was amazingly soft and almost had a melt in your mouth sensation and went a little too well with the slightly soggy chips. The mustard aioli was also a great addition. Cons; for $9.50 I thought the meal was very small, especially for take away food, and the parsley was cut way to big and overpowered the taste of the lamb. All in all, it was still a great tasting meal, next time I go down I will be trying the combo of lamb and chicken! Dinner that first night was left undecided and boy am I happy we didn’t plan anything. 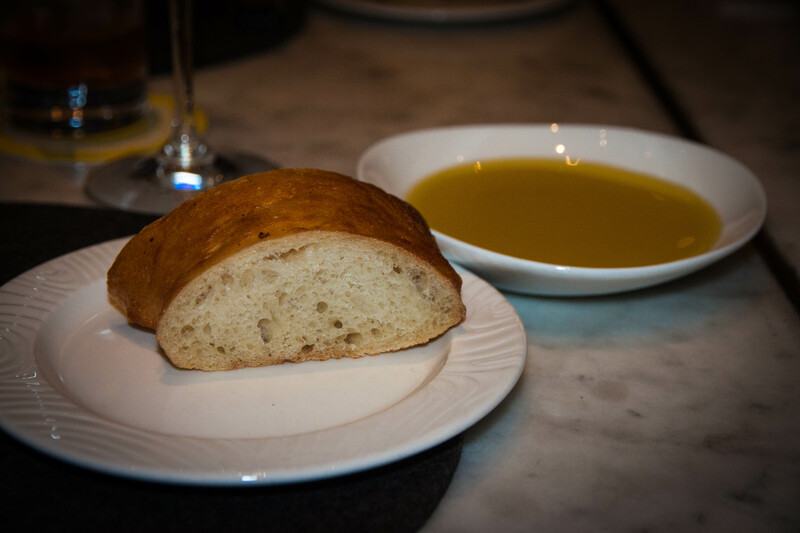 We ended up going to Neil Perry’s Italian restaurant ‘Rosetta Ristorante’ at the Crown Casino. Having my parents speak Italian is always a plus because they tend to get along well with the waiters. The place was packed and we didn’t have a reservation but dad worked his magic and spoke some of the lingo and what do you know there was a beautiful table ready for us outside! Side note, my photos from the 3 days in Melbourne weren’t really top notch (perhaps there was just too much wine involved) A lot of the restaurants were quite dark so it was hard to take photos, some were even taken on my phone, so just pre warning everyone, not to the high standards that I would’ve liked! Moving on, as we were deciding what we wanted from the menu, the waiter bought over some beautifully crisp bread that tasted like a mix between Turkish and focaccia bread. The never ending oil was heavenly, then after a sprinkle of some pink Himalayan rock salt, I was set. I literally would of been happy with a loaf of bread for dinner. …But who am I kidding, it’s me we’re talking about, where’s my main! 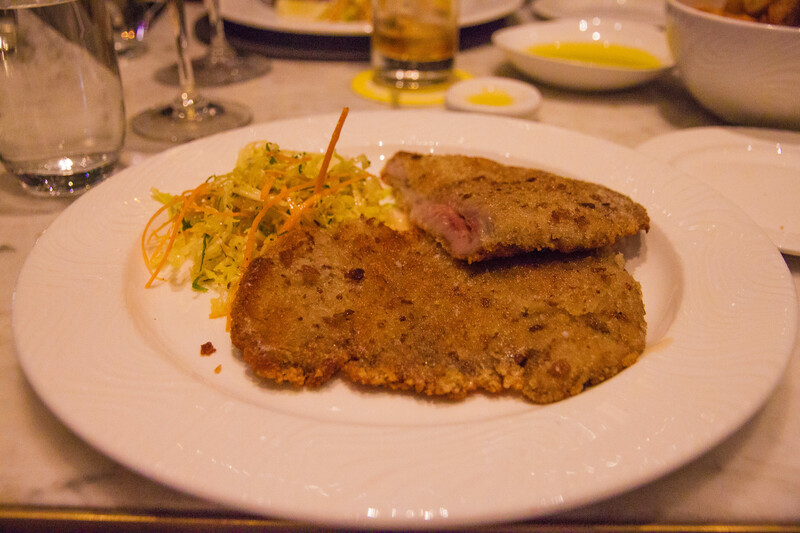 I ordered the ‘Vitello alla Valdaostana’ ($49) which was a crumbed veal loin filled with prosciutto and taleggio. The Italian prosciutto was thin and tasty and balanced delightfully with the crunchy bite of the veal and then with the gooey taleggio. A beautifully constructed dish that I definitely wouldn’t say no to if offered to have it again. I did find towards the end that it did become a bit sickly, so I had to take a few breaks between bites. For Dessert we ordered an array of dishes but I’m kicking myself because the one photo I got of the Tiramisú ($21) was blurry! and it was the most amazing Tiramisú I have ever had in my life! The mascarpone cream was so deliciously fluffy and was not overly wet or runny like some tiramisu’s can be. Nick ordered the Torta al Cioccolato ($20) a flourless chocolate cake with vanilla Chantilly and grated milk chocolate. It was good, not dense or heavy at all but after that Tiramisú I just don’t think anything compared. 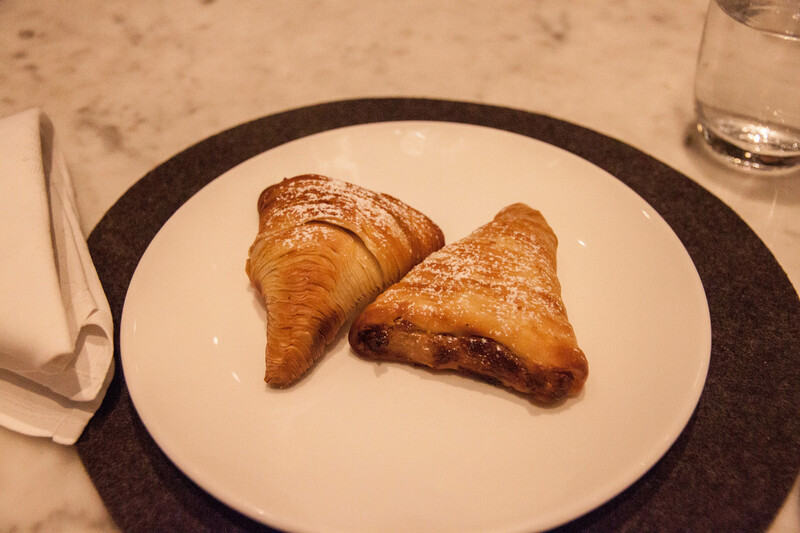 For me and mum, we ordered two ‘Sfogliatelle’ ($5). The pastry was fluffy and ridged and the ricotta cheese was slightly lemony leaving a delightful after-taste, but after being spoilt and having freshly made ones coming out of my Nonna’s hot oven every couple of months, it’s hard to even compare it to that! Day 1 was a great success in Melbourne! 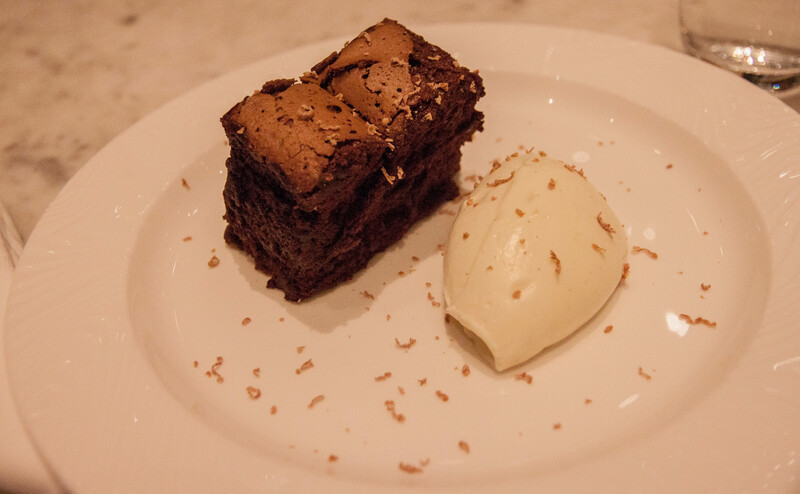 Bet you can’t wait for the next two days and trust me you thought this dessert was good… It get’s ten times better! What a great recap of our time in melbourne. We went to some great eateries keep up the great work guys always a great read. I love sfogliatelle! One of my favourite pastries ever! Will def check out Jimmy Grant on my next melb visit. I wish I was back in Melbourne! EAT AS MUCH AS YOU HUMANLY COULD!! !